Directed by Shoojit Sircar and written by Juhi Chaturvedi, October will evoke sadness and a smile at the same time. A brilliant love poem in today's world. A story about love, loss, hope, and life. Reality is what Shoojit Sircar shows in October. Two hotel management trainees Danish Walia a.k.a Dan (Varun Dhawan) and Shiuli Iyer (Banita Sandhu) and how their life unfolds in some surprising and real ways, will leave you amazed. Shiuli, a junior who is in Dan's batch because of her intelligence, always has her eyes on him but does she like him? They hardly interact but life brings them together in the most shocking circumstances. Is that friendship? Or love? The USP of the film is Juhi Chaturvedi, the writer. This story cannot be explained in words because you have to watch it to feel it. Varun Dhawan: I refuse to recognize him as Varun Dhawan post this film because he is Dan - he will teach you love, friendship and variety of emotions in the most honest, immature, restless, silly and funny way. Dan's character is relatable in so many ways. It will push you to question the way you treat life. He got a lady to get Shiuli's eyebrows done in hospital; he talks to his friend about the 19 pipes connected to Shiuli's body; while Shiuli's best friend moves on, Dan asks 'how unaffected can you be' -- and all this when Dan and Shiuli are not even close. Banita Sandhu: What a debut lady! Bravo. With very few dialogues, this British-Indian actress will win your heart with her beautiful eyes that do all the acting. She is pure. Gitanjali Rao: Vidya Iyer, an IIT professor and single mother, is brilliant as Shiuli's Amma. Where to begin, because there are so many! Shot in Dwarka and Kullu, the film will bring tears in your eyes. 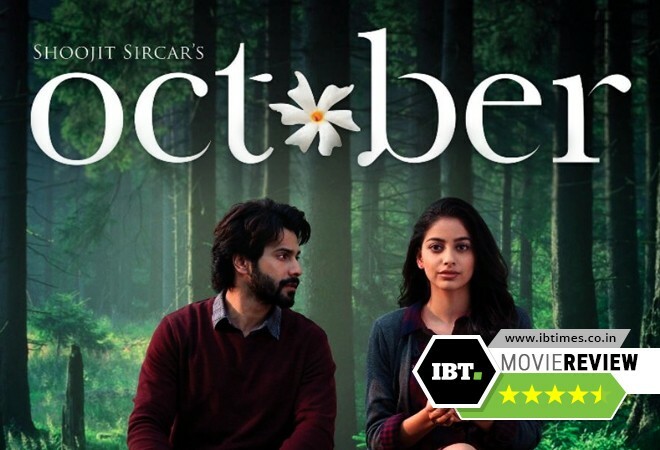 In a not-so-Punjabi Delhi (yes, Shoojit will break the cliché), October will touch your heart with its original and ambrosial story. The supporting cast -- be it Shiuli's best friend or Dan's mother or even the nurse at the hospital -- casting director Jogi has done a marvelous job. That haunting beep sound of the hospital machines or the theme music of the film by Shantanu Moitra - everything is magical and holds importance in the film. The camera work, the way Shoojit has shown nature, flowers, weather and its connection with life is nothing but poetic realism. Yes, the film was not fast paced. It cannot be as it needed to be felt. But I still feel, it could have been just a little shorter. Forget Badri, Rohan or Raja, Varun Dhawan's effortless act as Danish a.k.a Dan will go down as his best till date. Shoojit Sircar and Juhi Chaturvedi, take a bow for giving us a different kind of love story to cherish.